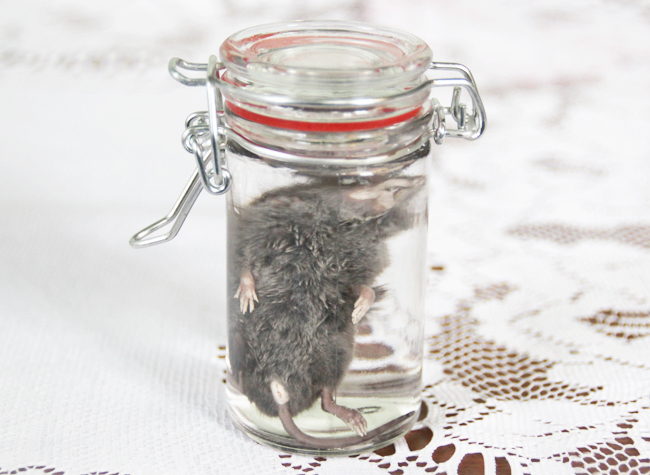 PONY PEOPLE: Dead animals in small jars. 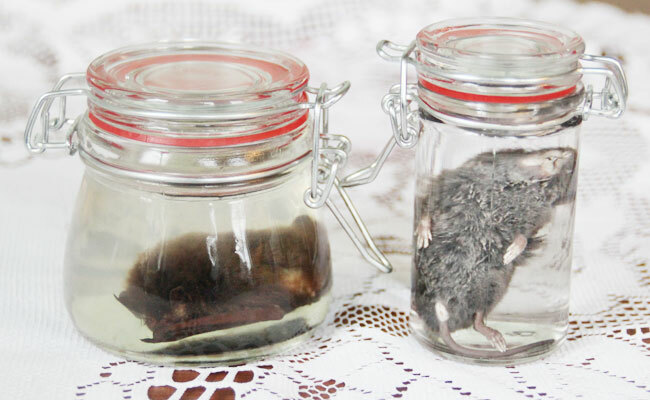 Dead animals in small jars. I just preserved my very first animals! Yes, that's how I like to spend my early saturday mornings. I used an 70% ethanol solution and just put them in small weck jars. Hopefully it'll work like I want it to. 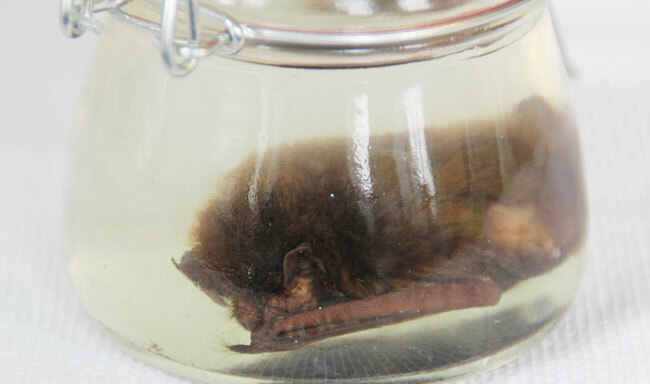 I preserved two animals, a small bat and a shrew mouse. 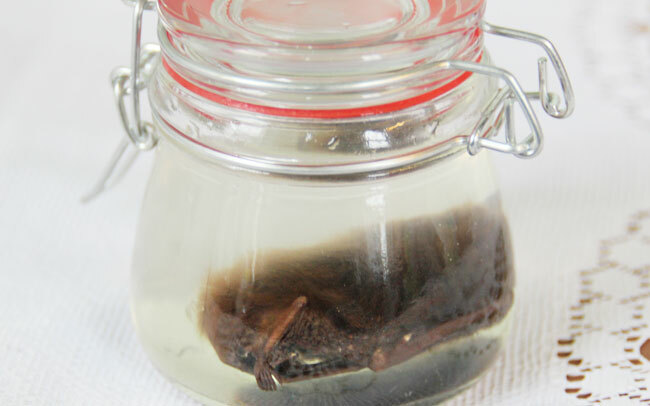 I found the bat in a small piece of tupperware soaked in some sort of liquor, probably wodka, when we were doing some spring cleaning. We have no idea whatsoever where we got it and who put it in the tupperware container. We thought we got it from my brother a few years ago but he doesn't think so, so it's sort of a mystery. Anyway, a tupperware container isn't really the place for such an amazing animal so I got a cute little weckjar to put it in. It may have failed though, the 'water' got a bit cloudy. I'm not sure why but it may be because I took it out of the wodka and I exposed it to the air. Unfortunately is was pretty impossible to take decent pictures of this guy. But you can see his wings, his ears and his feet! The shrew mouse was actually in the dead-animal container in my freezer. May sound a bit weird considering I'm a vegetarian (I guess non-vegetarian people have loads of dead animals in their freezer haha), but I store every dead animal I find in there. I have always wanted to do some taxidermy so I freeze dead animals I find so I can practice on them later. I haven't tried yet though. 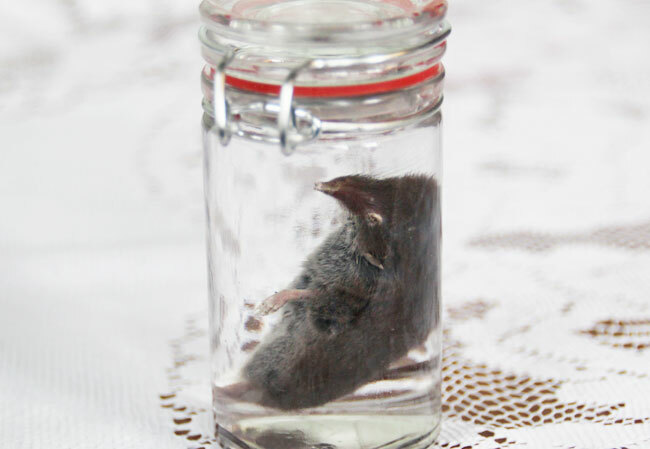 This cute little shrew was brought in by my cat Brian and fits exactly in the other weckjar I got. I may be even more excited about this guy than the bat because he has the best pose ever. So! Cool hu?! 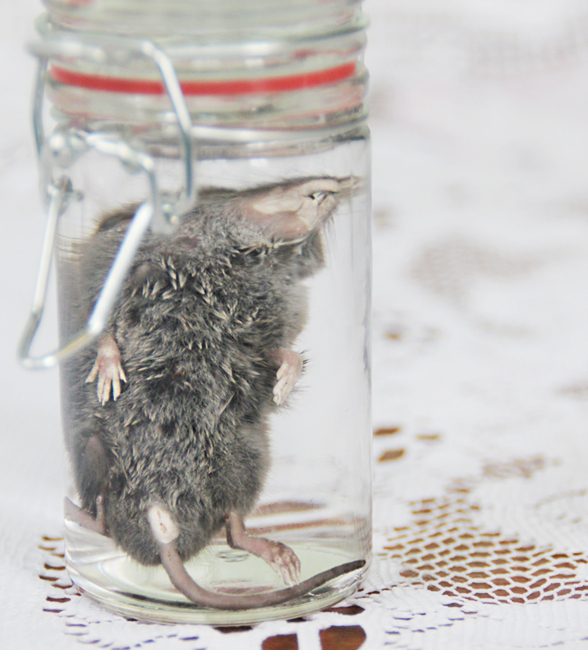 I am super excited and will be collecting weck jars and dead animals like a mad woman. Also, I will be digging up the dead mole I found a few months ago soon! Fingers crossed all goes well! Ahhh, heel mooi.. en ben heel benieuwd hoe je het voor elkaar gekregen hebt! Ik heb contact met een schapenboer uit de buurt die me zal waarschuwen zodra er weer een miskraam of een dood lammetje geboren wordt, zodat ik kan proberen om die schatjes te preserveren!